Does The 'Close Door' Button Actually Work? The button is everywhere. It allows us to interact with our computers and technology, alerts us when someone is at the front door, and with a tap, can have dinner delivered to your home. In the late 19th century, buttons were being developed as a way to interact with electrification that was coming into homes and workspaces. Buttons were used as a form of one-way communication in wealthy households and would later be developed for consumers to interact with vending machines, cameras and other tools. But buttons also are often associated with feelings of control, panic, and fear. In her book, Power Button: A History of Pleasure, Panic, and the Politics of Pushing, Rachel Plotnick says “buttons continue to crystallize enduring societal hopes and fears about ‘easy’ technological solutions to all manner of problems.” Plotnick discuss the development of buttons and what they reveal about our interactions with technology. Read an excerpt of “Power Button” here. We asked you on Twitter what your favorite buttons were to push as a kid. Keep them coming in the comments! We’ll be talking about button technology on @scifri this week. Is there an iconic button you remember as a kid? What made it special? Push button light switches from my grandma’s house. Bakelite buttons with the on button inlaid with mother of pearl. Harder to use, but much more satisfying. i strangely remember those old coffee machines that dropped the cup and dispensed coffee and you had choices of cream sugar double sugar etc…. they often had cups with poker hands on them for some odd reason of supply of paper cups… anyway… they had a good chunky click. Read an excerpt from Plotkin’s book, Power Button: A History of Pleasure, Panic, and the Politics of Pushing. Learn more about reddit’s mysterious button experiment in The Guardian. Rachel Plotnick is the author of Power Button: A History of Pleasure, Panic, and the Politics of Pushing (The MIT Press, 2018). She’s also an assistant professor of Cinema and Media Studies at Indiana University in Bloomington, Indiana. JOHN DANKOKSY: This is Science Friday. I’m John Dankosky sitting in for Ira Flatow. We’re going to talk about a piece of technology now that you might overlook, but it’s everywhere. You use it to turn on the lights, to communicate with co-workers, even order a meal. I’m talking about the humble button, that tiny piece of tech that you use to interact with almost everything. But a button is not just a button. You’ve heard the phrase, “pushing my buttons” or hot button issues. What about the big red doomsday button? And today, we click and we swipe with a new kind of button. Why do we have all these feelings about buttons? Where do they come from in the first place, and what do they tell us about our relationship with technology? My next guest is here to talk with us about this. Rachel Plotnick is an assistant professor of cinema and media studies at Indiana University in Bloomington, and she’s the author of the book, Power Button, A History of Pleasure, Panic, and the Politics of Pushing. Rachel, welcome to Science Friday. Thanks for being here. RACHEL PLOTNICK: Thanks so much for having me. 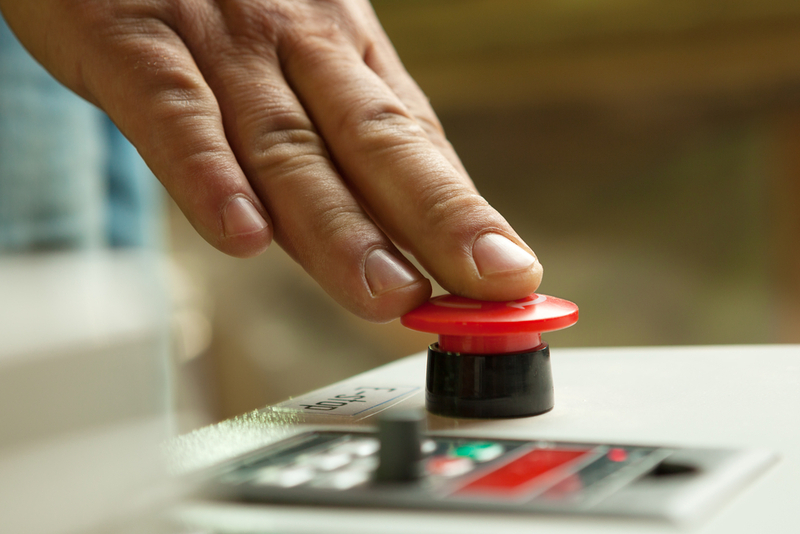 JOHN DANKOKSY: And if you’ve got a pressing button question, how they work or why we need them or a story about a button mishap, you can call us at 844-724-8255. That’s 844-SCI-TALK. Or tweet us @scifri. Why did you get interested in buttons? RACHEL PLOTNICK: You know, I sort of stumbled across it, as many I think academics do, find their way to these strange topics. I was really interested in questions of remote control and who gets to hold the television remote, all of the power dynamics around that. And the more I began looking at remote controls, the more I realized that the buttons on the remotes were really interesting. And as I looked around the world, I saw, wow, there are buttons everywhere to do everything and interact with every form of technology, communication, play, work, and I just began to wonder, how did we become this society that is so essentially transfixed with pushing buttons. JOHN DANKOKSY: Did buttons really come about when we first started electrifying everything? Is that really when buttons took hold? RACHEL PLOTNICK: You know, it’s a funny question because we could think of buttons in many different ways. Of course, we all have belly buttons. We could think about the clothing buttons that keep our clothes attached to us. But pushing a button really did come about in the 19th century, around the time of industrialization and electrification, as people began to think about, what’s the most efficient and satisfying way to carry out an act with electricity. So I would isolate that moment as when people really began thinking about this idea of pushing a button. JOHN DANKOKSY: Is it about making the untouchable touchable somehow, of harnessing electricity was just a simple finger? RACHEL PLOTNICK: That was definitely a big part of it, yes. I think at this period in time, most homes of the late 19th century didn’t have electrification. So the idea of even interacting with electricity on a daily basis was very threatening or intimidating, and buttons provided this really safe unintimidating face to interact with, whether that was a light switch or a bell or these other kinds of technologies. So if you could put that simple interface or face in front of it and say, all you have to do is push a button, then people didn’t have to be worried about getting electrocuted or wondering what was going to happen with electricity. JOHN DANKOKSY: It’s kind of hard for us to imagine, but pushing a button wasn’t really easy for the first generation button pushers, as you call them. What were some of the mishaps? I mean, I’m sure engineers had a really hard time convincing people to push buttons or to show people how these things are supposed to work. RACHEL PLOTNICK: Yeah. I uncovered so many interesting stories about these button mishaps, and probably we have just as many of these stories today as well. But people would talk about pushing the button and nothing would happen at all, and they just wonder, does the button even works. Of course, there were those rare stories of people getting injured from pushing buttons or just various miscommunications that would happen around pushing a button that would just trigger bells all over one’s household or all over a factory and you couldn’t get them to stop. And so I think there was a lot of question around, are these actually really as efficient and satisfying as a form of interaction as we think they should be. And that’s often why children were the first to use buttons even in schools because they thought, hey, let’s introduce them to children, teach them how to use them, then everybody else maybe will too. JOHN DANKOKSY: It’s sort of like now, a child picks up an iPad or knows what to do with it. Maybe somebody who didn’t grow up with an iPod doesn’t know how to do it, but they actually had designs to keep boys from pushing buttons back in the day because, well, boys like to push buttons back then, and they would hold them down and cause all sorts of problems. What did those buttons look like? RACHEL PLOTNICK: Yes. Those were some of the funniest stories to me were just people complaining about children pushing buttons, honking automobile horns, or running up to people’s doors and ringing doorbells just to see what would happen. And I think that was really this funny dichotomy that I uncovered was on the one hand, hey, let’s introduce children to push buttons. They can kind of be our guinea pigs as the first generation of button pushers. And on the other hand, oh, no, all these children are running around pushing buttons. What are we going to do with them? So I think so easy a child can push a button became this really complicated slogan when we saw what children actually did with buttons. JOHN DANKOKSY: And there were, early on, there were good button designs and there were paw button designs. What were some of the less successful designs? RACHEL PLOTNICK: Yeah. I think one of the interesting things about button technologies at this time period was buttons could be made out of so many different things. So I mentioned school before, and children could make buttons out of wood or very inexpensive technologies and the same thing for early button manufacturers. People talked about switches that didn’t worked very well, whether they didn’t conduct electricity well or they would just fall apart or break and you couldn’t repair them easily. So I think there was a lot of talk about how do we make a button that functions effectively and is also cost effective. JOHN DANKOKSY: There’s a lot of really interesting sociology in your book, and especially in the 19th century, buttons were showing up in the homes of wealthy families, and they were replacing bells. And this changed in a lot of ways their interactions with, I suppose, the help. RACHEL PLOTNICK: Absolutely. That was one of the most interesting dynamics I studied and learned about was that you’d have wealthy homeowners, especially housewives in their houses who would affix buttons to the bottom of their dining room tables or at their bedsides and they would use them to call servants. And this replaced earlier bell technologies like bell poles where you would pull a really heavy handle to get the bell to ring. But there were lots of problematic dynamics between housewives pushing buttons and then servants responding to them. So a lot of times, servants would just pretend they didn’t hear the button and not actually react. They’d say, oh, the button didn’t work. I didn’t hear that. It’s kind of a subversive way of resisting being called in that way. So I think many servants didn’t like this idea of being treated at one’s beck and call that they were just supposed to magically appear anytime someone pushed a button. JOHN DANKOKSY: It’s still kind of, though, how we think about buttons. I mean, we still press a button and we expect something to happen. It’s a vending machine or it’s a, I don’t know, it’s an app on your phone that sends a car to come get you. That really hasn’t changed after all these years. RACHEL PLOTNICK: It really hasn’t. That was a tremendous revelation to me was just that buttons have always really been caught up in this idea of instant gratification. Pushing for your pleasure, and I think it’s that idea of cause and effect. I push the button, and then I’m gratified by getting whatever that thing or person is that I want, has been one of the most seductive elements of push buttons. JOHN DANKOKSY: You also write a lot about the dynamics in the workplace, and not the domestic workplace, but in the factory, in the shop, that you ended up having two different types of workers– people who were button pushers and people who then did stuff because people were pushing buttons, and that was a difficult dynamic. RACHEL PLOTNICK: Exactly. I sort of identify that as what I call the difference or the stratification between manual labors and digital laborers. And manual labor is where people who actually had to use their hands and respond whenever a high level boss would call them, push button manager. And then the push button manager became this kind of digital laborers because they would literally, with their digits, just push the button and call people to their desks. And there were constant complaints about this notion that I’m being abused, I’m being treated badly by having to just show up anytime someone calls me to push a button. You’re just sitting there without getting your hands dirty while I’m doing all the work and responding every time you push the button. JOHN DANKOKSY: A lot of people were pushing buttons and trying to call us to join the conversation. So let’s join Eric right now. Eric is in Rochester, New York. Hi, there, Eric. JOHN DANKOKSY: Hi, what’s your thought? ERIC: Oh, one of my favorite myths, I served on the elevator board in the city that I live in for a number of years. And terms got tossed around, and my favorite one is “elevator buttonitis.” And that’s the mistaken belief that by pushing the button to bring the elevator more times than one, it will come faster. ERIC: And that ain’t how it works. JOHN DANKOKSY: So people believe that if you press it a whole bunch of times, it will start to come faster. You just press it once, that’s all you need, right? ERIC: That’s all you need. That’s not– the mechanics and the electronics of elevators don’t work to be pushed a number of times to make it come faster. JOHN DANKOKSY: OK, Eric. There’s another myth, though, I want to clear up since you were on the elevator board for your city. So I get inside the elevator and there’s the button that says, I can close the door, I can open the door. Do those buttons actually work? ERIC: They do a little bit. Of lot of elevators are timed, and I think that’s becoming more and more important with handicap access, so that people have enough time to get out. And often, they can be programmed in to be shorter, but I think generally speaking, they do work some. JOHN DANKOKSY: Well, Eric, well thank you so much for the phone call. I’m glad you raised this very important point because, Rachel, I wanted to get to this. I mean, the elevator button is a really big one. RACHEL PLOTNICK: Yeah. It’s one of the most fascinating and fun buttons to talk about. I think people always have stories about elevator buttons. And Eric’s comment, I think, speaks to that very idea of what people often call the placebo button. This idea that we want to push the button, whether or not we know that it actually does anything. And the same applies to crosswalk buttons on streets. You know, New York City tried to eliminate crosswalk buttons, people got really angry about it. So I think there’s this kind of user agency component here where we want to feel in control of our technologies, even though there might be a computer behind the scenes that’s actually controlling what that button does. JOHN DANKOKSY: But that user agency, that’s a big part of the story of buttons. I mean, even if the button doesn’t do anything, you’re feeling like you’re doing something, and that’s something that we’ve learned over this century plus of pushing buttons all the time. We expect something to happen. So we want that control, right? RACHEL PLOTNICK: Absolutely. You know, it’s a really potent control mechanism, a push button, because it does seem like it provides that kind of control. But I think that’s also what provokes anxiety and makes people feel sometimes like they’re not in control is when the button doesn’t do what you expect it to do, or you’re not really sure what the effects will be. So it kind of is a double edged sword in that way, that we want that sense of mastery and control, but we also sometimes recognize that pushing a button may not actually give us the desired effect. JOHN DANKOKSY: So you’re talking about early buttons that could be made out of wood. Of course, now we have all of these different types of digital buttons that are designed in different ways. And we’re not always just pushing them, we’re swiping left and swiping right. Have we learned how to design a better button for humans? RACHEL PLOTNICK: I think buttons, in many ways, have gotten much more complicated because if you think about the buttons you use now digitally or on touch screens, quite often, you have to hold down the button, and then that will give you a menu of different choices, or you can click left or right on the button and it produces different functions. So in many ways, we don’t have that binary that we used to, where it’s either just on or off or stop or start. You have to really understand all the different conditions that are involved with pushing buttons. And that may be one of the reasons why we see more and more designs moving away from buttons is because, in some ways, they’ve gotten more complex as they’ve also gotten simpler. JOHN DANKOKSY: Doug actually tweets at us something that I was interested in. Yes, are buttons with physical tactile feedback more popular than touch screen buttons with or without this kind of feedback. What do you know about that? Because I know with my new smartphone, I like it when it gives me a little buzz or when it makes a little ding. I want to feel something or hear something. RACHEL PLOTNICK: Absolutely. I think people really desire feedback from their push button interactions, whether that’s some kind of haptic feedback, like the vibration or something lights up or gives you some kind of cue. We need transparency with our buttons, and I think that that’s what makes them a lot more usable. And when people don’t have those kinds of cues, that’s when that feeling of lack of user agency really comes into play. JOHN DANKOKSY: We’re talking about buttons, and the book is, Power Button, A History of Pleasure, Panic, and the Politics of Pushing, and we’re talking with Rachel Plotnick. I’m John Dankosky. This is Science Friday from WNYC Studios. Of course, we’ve been talking about buttons that do things for us, but there’s this fear of buttons, including the big red disaster button. How did this fear come about? RACHEL PLOTNICK: It’s so interesting that we’ve been talking about a fear of push button warfare since the 19th century. People always imagined what would happen if there was this one big red button that we could push that would blow up the world. I really became interested in some of the early prophecies. Some people talked about Thomas Edison, because, of course, he was a major figure in electrification in the 19th century, as becoming too powerful. And if he decided one day he just wanted to blow up a country at a whim, he would just do that by pushing a button. And a lot of people talked about push button warfare as representing the end of civilization because it took away kind of that intimacy and closeness of taking someone’s life and instead, doing it at a remove and with a push. So we tend to think of push button warfare as having to do with the Cold War, but in fact, people have been worried about that for a really long time. JOHN DANKOKSY: It’s so interesting. I just always assumed it did correlate with the Cold War, that it must come along sometime around nuclear weapons, Dr. Strangelove, and all that. That feels to me like when the big red button came into consciousness. RACHEL PLOTNICK: I think definitely that was a moment of moral panic, and I’ve done a lot of research over just kind of tracing that phrase, “push button warfare,” in popular newspapers over time. And you see a massive spike around the Cold War in the 1950s and ’60s around that phrase. So yes, that was definitely a really iconic moment. But on the other hand, you had many things happening around the death penalty by electrification and issues about doing everything by button in the 19th century. So people were already worried about that next theoretically logical step where, OK, we’ve done all these other things by button, is warfare coming next? JOHN DANKOKSY: I want to get to another consumer question here. Manuel is calling from Gettysburg, Pennsylvania. Hi, there. You’re on Science Friday. MANUEL: Yeah, hi. I’m calling– when I was a young, my father had an old car, and it had a push button transmission. And I’m just wondering why that never caught on and became a real thing? JOHN DANKOKSY: It’s such a good question. Now what do you know about that, Rachel? RACHEL PLOTNICK: Yeah. I looked a lot at early push buttons on automobiles and from starters and transmissions to different things. It’s interesting that in the history of automobiles, buttons were originally introduced to try to encourage women to drive. Women were supposed to be frail. They didn’t want to get dirty, theoretically, right, so the idea was, oh, let’s just give women a button, then they’ll want to drive their automobiles. So I think there’s always been something associated with driving and this kind of ease of use around push buttons, especially around this female subject. I’m not sure exactly why it didn’t catch on with automobile transmissions specifically, but it is interesting to see how push button designs come and go with driving. They’ve sort of went away for a long time and now that’s back as being very en vogue. JOHN DANKOKSY: Another question here from Roger in Madison, Alabama. Hi, there, Roger. Go ahead. ROGER: Hi. I’m wondering why the flip switch won the war of turning lights on and off in most houses, and I have a theory about it. JOHN DANKOKSY: Oh, you have a theory about it. Very quickly, what’s your theory? ROGER: I think it’s because people have packages in their arms and they can flip it with their elbow. JOHN DANKOKSY: Oh, they can flip it with their elbow. ROGER: They can’t do it so easily with a button. JOHN DANKOKSY: It’s such a good question. I’ve been in old houses, Rachel, where they still have the old push button to turn on and off the light, but he’s right. The flip switch won that battle. Why? RACHEL PLOTNICK: Yeah. It’s a great question. So, yes, originally, light switches were push buttons. You’d have the white button for light and the black button for dark or off, and it took a while really for these toggle or lever switches to catch on that we use today. It wasn’t until about 1915 that you saw patents for those switches, and that’s because people were really experimenting with doing everything by button before that. I think that elbow theory is definitely part of it. People talked about wanting to be able to keep their hands free, and that lever allowed you to do that, of course, so I think that was part of it. The other thing is that push buttons that are embedded in surfaces like that were often very difficult to repair. They’d get dusty or there were problems with extracting them from the wall, so it often became more expensive and more difficult to repair them. So that was another reason that toggle switches became more popular. JOHN DANKOKSY: Last quick question for you. There was this incident in Hawaii that someone accidentally tweeted out a missile warning because of an accidental button pressing. What are we doing as far as safeguards for our buttons? Because it could be so easy to set off a real disaster. RACHEL PLOTNICK: I think that’s a great question, and that’s where it gets to the problem of buttons can be, on the one hand, very complex, but on the other hand, often too simple. And I think we have major anxiety about that of what if the wrong person stumbles across this button and carries out some action that we don’t want them to. So this question of safety is a really interesting one. Even in the 19th century, we were putting buttons behind glass and saying, OK, only push in case of emergency or that the fire alarm button and these kinds of things. So there is that tension between trying to make buttons easy to use, but also opening them up to all these kinds of vulnerabilities that people will do the wrong thing with them. JOHN DANKOKSY: It’s a fascinating history. Rachel Plotnick is an assistant professor of cinema and media studies at Indiana University in Bloomington. Her book is, Power Button, A History of Pleasure Panic and the Politics of Pushing. Thanks so much, Rachel. JOHN DANKOKSY: You can read an excerpt of the book on at website, ScienceFriday.com/Button.